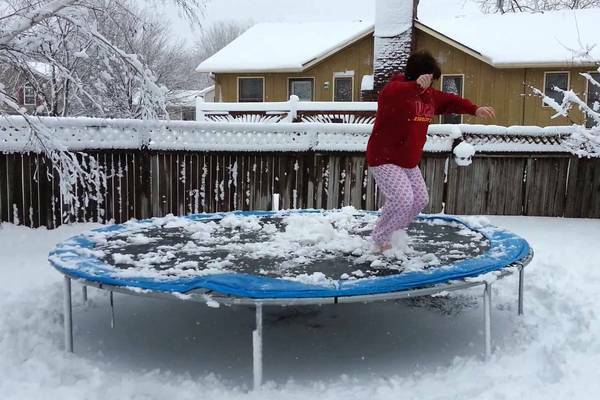 » Winterizing Trampoline – Will Snow Ruin a Trampoline? During winter, should you and your loved ones stay indoors from morning to evening? Does it mean that you should neglect fun activities such as jumping on your trampoline? Winter is a regular season, and you shouldn’t let it prevent you from having fun. It might be a bit cold, but you can blow off some steam and have fun on your trampoline. But most people often wonder, will snow ruin a trampoline? 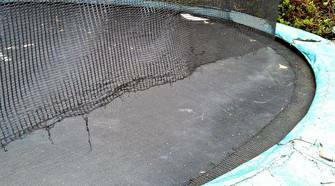 The article will focus on winterizing your trampoline. You will get to know how to enjoy your trampoline during winter, how to take proper maintenance of it and much more. Winter doesn’t mean that you should put your trampoline aside. Trampolines are ideal workout stations for both kids and adults, and that’s good for your health. Will A Trampoline Break in the Cold? Can You Leave Your Trampoline Out in the winter? Do You Need a Trampoline Cover For Winter? How Long Do Trampolines Last? What are Some Trampoline Storage Ideas? What About a Trampoline Store Bag? A trampoline is made and designed to endure all weather conditions including winter. However, this highly depends on the quality. But, during winter you should give your trampoline extra attention and maintenance to make sure it survives the season. It’s because the snow can pile up on the trampoline and make it hard for you to access it. Once you follow these maintenance tips, you can be assured that it will survive the cold. And you will be able to enjoy engaging in all sorts of activities such as skiing on your trampoline. Yes, you can. However, there are precautions you need to take so that you ensure its safety. The following are some of the measures you should consider. You need to assess the amount of snow you get in your local. If it’s not much, then you and your family can still access it. But, if the snow is too much to a point where it can bury the trampoline, then you ought to put it indoors. The presence of high winds is another factor you should consider. You don’t want your trampoline to end up on your neighbor’s fence or backyard. You should ensure you anchor it to something sturdy, to avoid it being blown away. Get yourself trampoline anchors if you still don't have it. Finally, you should ensure that you cover the surface of the trampoline with a trampoline cover. It will help ensure that the trampoline can withstand the season and retain its original shape. There is no need for storing your trampoline indoors. Mostly because they are large and you might not have adequate space in your garage or store. Plus, you shouldn’t miss out on all the fun you can have on your trampoline, as long as you put in a little effort and follow the above precautions. If you are not happy with the Upper Bounce trampoline cover, click here to check other options. You should know that weather doesn’t affect how long your trampoline will last. But other factors guarantee its lifetime. Similar to other products, with enough maintenance, your trampoline can last for years. Below are some of the elements that will ensure it lasts for long. First and foremost, you should always keep it clean. The mat is vulnerable, and objects such as debris and tree branches can damage it. Especially during winter, the high winds can carry lots of dirt to your trampoline. You should make a plan to wash it with water and use a soft brush to remove the debris. Visit our easy steps to clean a trampoline guide for tips. You should use the right footwear. Even during winter, most people might be tempted to jump while wearing shoes. You should instead wear socks. It will help reduce the amount of debris getting into your trampoline. Finally, you should make a habit of always checking if it requires any repair. Due to the continuous jumping, especially if you have a big family, the springs might break, or the pad’s fabric might tear. Checking for repairs can help you fix the problem before it worsens. Visit our trampoline care and maint﻿e﻿nance for more tips. Jumping on a trampoline in winter is more fun than doing it during summer. In winter, jumping helps you beat the cold because your body will generate heat. As a result, you will feel fresh, alive and very active. Plus the cold weather makes most people dull. There’s no better way of livening up your day other than jumping on the trampoline. If the trampoline is frozen, you can remove the snow from the mat and start jumping. 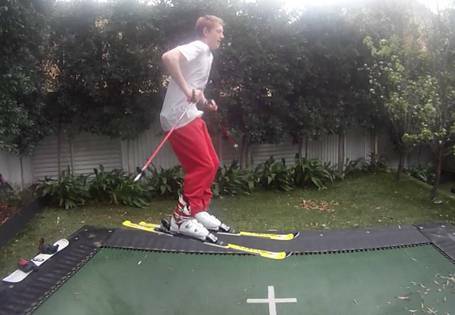 Or you can be more creative and try skiing on the trampoline. However, some days it’s too cold for you to go jumping on the trampoline. The people living in areas that get lots of snow can even go for days without seeing the trampolines. In such a case, there is no other alternative other than moving it indoors. But this can be a challenge to people with not enough space in their homes. There comes a time when you can’t be able to use your trampoline at all. At such moments, it’s best if you store it. 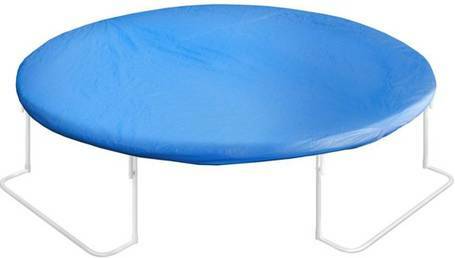 You can either use a trampoline cover as mentioned above. It’s a popular storage idea that most people use. You can also opt to store it in your garage if you have enough space. Now that you are familiar with winterizing a trampoline, you need not worry if snow will ruin your trampoline. Taking proper care of it ensures that it will serve you for long. You should always check out if the mat, springs or frame are in excellent condition. You should clean it on the regular and store it properly during the off-season.